I have very little love for Rogue One: A Star Wars Story — many things come off as arbitrary, but nothing more so than Darth Vader’s “lava castle” on Mustafar. 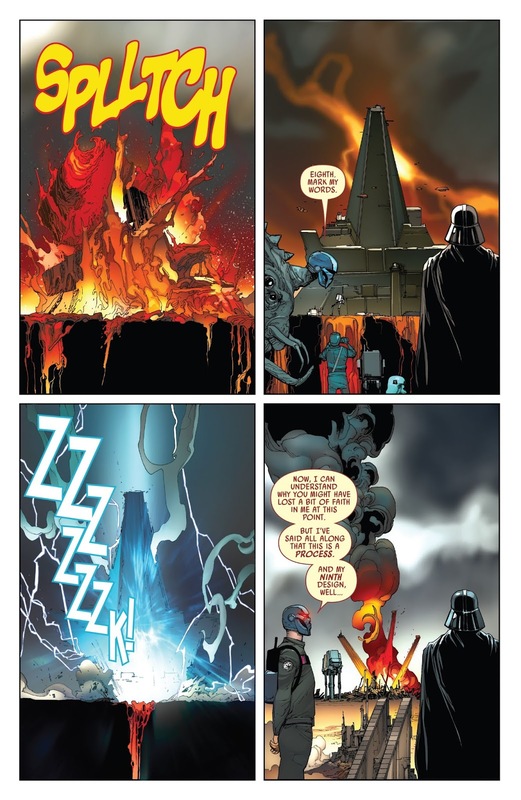 But as he has done since the beginning of this series, Charles Soule takes something as simple as “Darth Vader has a lava castle” and adds deeper layers of pain, love and art to it. Darth Vader 23 is the latest chapter of “Fortress Vader” where the Dark Lord of the Sith has enlisted the aid of the Momin, who can best be described as a “Dark Side Artist.” With Soule’s Darth Vader series coming to a conclusion, he seems to have saved one of his more interesting concepts — Momin — until the end. Momin is part architect, part artist, and all-around sonofabitch. Harnessing the dark force energies of Mustafar, Momin constructs and reconstructs Vader’s fortress almost ten times — the artist who is never satisfied. Giuseppe Camuncoli provides a great montage sequence of this process, showing the passage of time by providing Momin’s mystical helmet with different host bodies. One of the host bodies that Momin possesses appears to be one of the natives of the planet, which I shall now refer to as Mustafarians — because it’s a fun word. Vader and Momin’s Extreme Makeover: Home Edition is tearing apart an already volatile planet, and the Mustafarians are suffering the consequences. There’s an element of colonialism present here, as Vader and Momin are exploiting the “resources” of Mustafar for their own purposes. Like any colonizer, Momin perceives the natives or the territory he is invading as inferior creatures — “beasts.” The fact that Momin is exploiting the land “in the name of art” makes his out-of-touch elitism even more prevalent. On the other side of it, Soule explores the nature of creating art. The creative process is made literal as Vader taps into the force to transform and construct his fortress — enduring a significant amount of emotion and pain in the process. Momin is the artist here and Vader is his instrument. Ultimately Momin is just another manipulator that is using Vader for his own purposes. Poor little Ani.